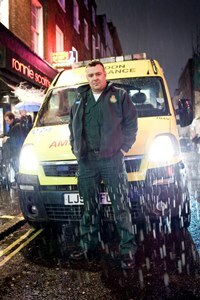 It is with very deep sadness that London Ambulance Service confirms the death of Clinical Team Leader, Brian Hayes. Brian died after a sudden illness at Waterloo ambulance station yesterday (Sunday 6 March). Brian joined the Service in 2001 and as well as being Regimental Sergeant Major for the Service’s ceremonial unit, he was the creator of the alternative response vehicle – the booze bus. Brian also played a key role during the Olympic Games as a manager at the Service’s Olympic Deployment Centre. Most recently he worked as a clinical team leader in the Cycle Response Unit. Chief Executive Dr Fionna Moore, who led the staff tributes to Brian, said: “Our thoughts are with Brian’s family and his many colleagues at this very sad time. “Brian was a big part of London Ambulance Service for many years and was much loved by all who worked with him. “Brian was also a caring and dedicated clinician and inspired more junior members of staff, helping them as they started their career in London. “Drawing on his military experience, Brian led the march past the Cenotaph to mark Remembrance Day on behalf of the Service for many years. Brian, who lived in Kennington, leaves behind a wife and three adult children.